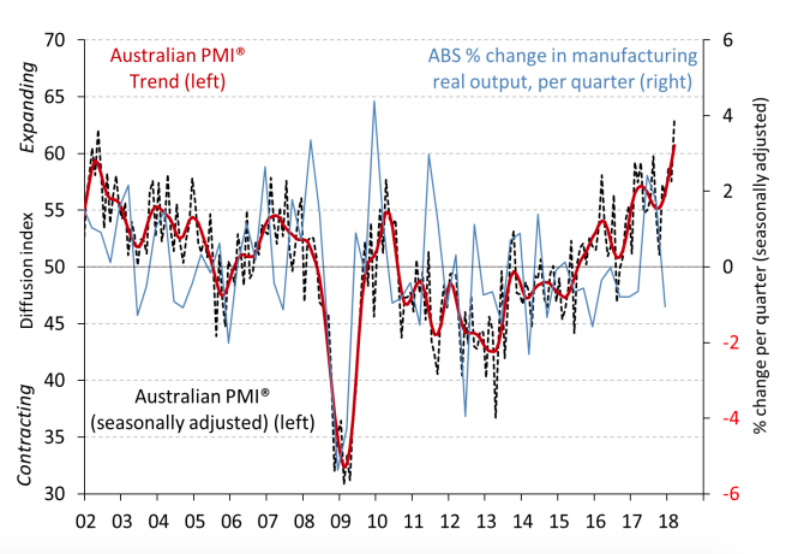 Australia’s manufacturing sector has extended its longest run of expansion to 18th months in March, with Ai Group’s Performance of Manufacturing Index (Australian PMI) jumping by 5.6 points to a record high of 63.1. According to Ai Group’s latest readings, all seven activity sub-indexes in the Australian PMI expanded for the fifth consecutive month, with new orders (up 11.2 points to 66.6), employment (up 2.2 points to 60.0) and deliveries (up 10.6 points to 66.6) all posting record highs. Seven of the eight manufacturing sub-sectors also expanded in March, with three sub-sectors – petroleum, coal & chemicals (up 0.7 points to 66.1); metal products (up 4.0 points to 62.3); and machinery & equipment (up 1.8 points to 62.0) – reaching record highs. Capacity utilisation also enjoyed a record high of 81.2% in March, offering encouragement for future investment and/or employment as capacity issues can be addressed by an increase in capital and/or employing more workers. Queensland’s manufacturing sector has performed particularly well in March with a reading of 73.8 points, with respondents in the state reporting increased demand from a broad range of sectors including construction, mining, agriculture and renewables. Commenting on the report, Ai Group Chief Executive Innes Willox said the ascent of manufacturing over the past month was good news for the industry. “Production grew beyond the strong levels recorded in February on the back of higher sales in domestic and overseas markets. Employment growth continued to increase with this sub-index of the Australian PMI® reaching a record high in March. Manufacturers reported new orders coming in at a healthy pace, in part reflecting the pick-up of work in mining, infrastructure and building,” Mr Willox noted.